Lots of sun and wind were on tap for the 2017 Alamitos Bay Yacht Club Memorial Day Regatta this weekend. 8 Aeros from California and as far as Utah and Connecticut sailed the outside course with the mulithulls, 29ers, Finns, and Lasers. Wind ranged from about 12-20 knots, with quite a chop stirred up by the wind. That made runs challenging: one had to steer up and down around waves because the boat was sailing faster than them. Later, the race committee treated our fleet to triangle courses (after someone told them Aeros like to reach) and man, those reaches were EPIC! I like to think we Aeros made a good impression on the other fleets. After racing on Sunday, a Nacra 15 sailor commented how they were sailing downwind under chute to the leeward mark near an Aero, and the Aero was keeping up with them! Berkeley Green, the local dealer, sailed a 5 and was happy with his choice when the breeze piped up. It’s so refreshing to see support of regattas by a local dealer! Mike Wilder is a machinist who has given a lot of thought to the Aero and how to get it around. He can singlehandedly slide the boat from or into the back of his pickup truck on a system of his own design, and designed/built his own aluminum dolly too. Oh yeah, when he gets home to his garage the whole thing lifts up out of the truck—some very clever engineering going on! Mike’s teen son Damien sailed the boat on Saturday and was a real trouper, bringing the boat up countless times after capsizing downwind. Personable Brad Cameron has been dragging the Aero demo trailer behind his van all over California for the West Coast tour. Brad has a composite back, the vertebra propped up in places with titanium rods and a carbon fiber cage. How Bionic Brad was sailing only 3 months after surgery I have no idea, but sail he did and in big breeze too! Caleb Everett is a big, strong guy who was trying out the Aero for the first time. An excellent sailor, he quickly got acclimated to the Aero 7 on Friday and was zooming around in the 9 on Saturday (unfortunately, prior commitments forced him to miss racing on Sunday). He’d make a great contribution to the class—hope he decides to join us! 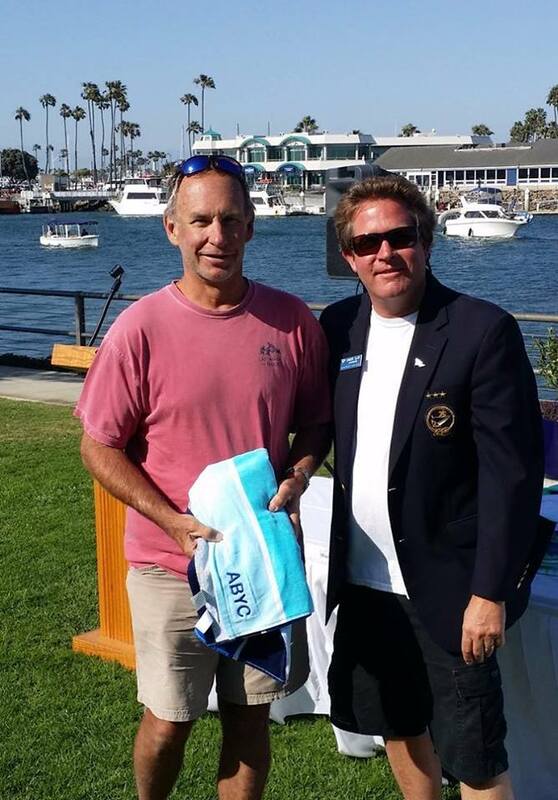 Master sailor Jacques Blanc is a very early US Aero adopter, and being a Long Beach local gets to sail his boat in those glorious conditions whenever he wants! We did some minor adjustments to his vang after Saturday (it didn’t have enough throw), and on Sunday he was looking fast. Jim Muir came down from Santa Barbara with his lovely wife for a brisk weekend of sailing. Jim is not a big guy but he’s fit, and steadily moved up the ranks as the weekend progressed. It’s tough to say who has traveled more for Aero regattas, Sim Thomas from Colorado or Doug DuBois from Utah. This weekend it was Doug who drove 15 hours from Park City for the regatta, and he was quite quick, even winning a few races. 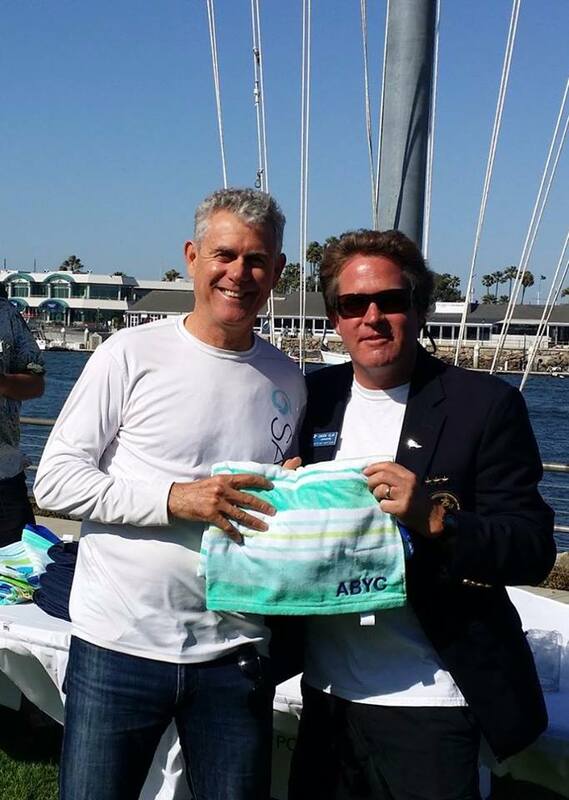 For me, it was a lovely reunion with ABYC (one of my favorite clubs in Southern California) as well as sailing friends I hadn’t seen in 20 years. To be sailing my Aero with new friends made the weekend that much better!